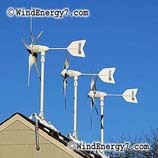 Home wind power products Only Available From WindEnergy7.com. The home wind power systems featured on this video are exclusive technology, WindEnergy7 has invented many of the best features in these systems making home wind power work. There’s a reason why these systems are so successful and effective, it’s mainly the ideas and innovations developed by WindEnergy7. > If you have FACEBOOK, Please Use Our LIKE Button at bottom of this post. The first system pictured here it the TowerMill, which is a product designed and manufactured by WindEnergy7, it is the best price/performance system available for home wind power. If you have the space and appropriate site for a TowerMill system, it is the best system you can buy. Talk to WindEnergy7 before you buy anything else to find out why this TowerMill is such a superior product to anything else out there. The second system pictured is the RoofMill, and exclusive invention of WindEnergy7 that is not available anywhere else. The RoofMill is the best green energy solution for urban and suburban installation. It simply mounts to the roof of almost any structure. Certified to 130mph wind, this durable, quiet system will reduce or eliminate your home electric bill. ONLY FROM: WindEnergy7-Com – WindEnergy7 LLC, The Home Wind Turbine manufacturers, located in Ohio, have an opportunity for people to get a system and become the local home wind turbine dealer in their local community. WindEnergy7 has a dealer and installer network in more than 30 states all across the US. > like to go solar and wind but the prices are steep. Sure, prices will come down. But these home wind/solar systems pay for themselves in 5 to 10 years, depending on wind/solar resources and your systems design. That’s a system that keeps making power for more than 30 years of life. That makes it a very, very sound investment and a good deal too. One of my goals it to lower costs through volume, but quality and value is first. These systems are the best price/performance ever made and easily pay for themselves, right now. – Only good for people who use electricity. – Only good for people who pay for electricity every month. – Only good for people who own a home, acreage, or business. That includes many, many prospective customers. Name me one, just one thing, that you could potentially sell those people that could give them 20 years of free electricity AND pay for itself. It’s at worst a 10 year return on investment (ROI), runs another 20 years, that’s 300% on the money invested. That’s if electricity costs never even go up, then it’s even better. AEP Ohio just announced 15% increase for each of next three years. Utility insiders and employees are reporting a coming run-up like we just had with oil. How Sure An Investment Is This Home Wind Turbine? It’s a s sure as the wind will blow, the utility company will send you a bill, and you will need electricity for your house. So, eep an eye on my blog. I am beginning a series of articles to start educating my dealer and customer network. The articles start with first in series is, my favorite subject. I start with The economics of price/cost and return on investment (ROI). I think that most people really don’t see clearly how good this is as a personal and family economic investment. I see very clearly as I sit here all day doing these analysis of system ROI. It’s amazing. I wish I was rich. If I were, I would plow every single dime into wind generation < AT CURRENT COSTS >. No doubt. The first article in the educational series should post tonight, maybe tomorrow at my blog. I’m going to systemtically lay out how to do wind system ROI FIRST. Then how to judge correct systems size/performance for a situation. Then start educating all about the systems, components, issues, technology. Some of that will be on the secured part of my site, for the dealers only. But allot of it will be for anyone, customers and whoever is interested. Since the new law was passed for the 30% IRS tax credit, customers get 30% of their system paid for by the IRS. All our system are qualified for full 30% credit. We have been fielding calls and emails from all over the country. This past year, we installed home wind/solar kits from Hawaii to New Jersey, Canada, and Europe. A home wind turbine kit is such a good investment. You can read about the new home wind turbine tax incentives here. We are starting a network of dealers and distributors right now and many people are getting in on this now, involvement is open to all interested. I am however not talking dealershp details to anyone who isn’t a customer first. If you buy a system, you can become a dealer with no further investment. There’s a very simple agreement and structure, all win/win. Based on geographic areas you can stake a claim now. On a higher level of dealer involvement, WindEnergy7.com is looking to create ONLY A FEW distributor level dealers. Again, first step is to buy and install a system, now you really in a position to show and help others do same. That’s about all the detail we can offer without being in the dealer group and under the NDA (non disclosure agreement). 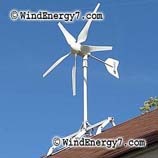 The hybrid rooftop wind turbine system in the video above is is around $16,000 for Grid-Tie system with battery back-up. Single turbine systems start at around $6000. That has every component with it (except batteries) which you buy locally, is a matched kit of components. It’s really a handyman level install, many folks put it in themselves and many have an electrician finish it up for safety. Pay by credit card secured, takes WindEnergy7.com about 3 weeks to pack and ship, the home wind turbine kits go out UPS Ground with Free Shipping. Our systems come with the whole Wind Turbine, Blades, Cone, Tail, Roofmount Kit, Pole, Charge Controllers, Solar Panels, Hardware, Inverter etc. The whole Kit of matched components is a complete home energy system. Did you see the blog post about the 30% federal tax break law, as soon as word got out on that new tax incentive just passed, This sites traffic went up dramatically in one day and sales are brisk ever since. Our customers ALL QUALIFY FOR 30% of INSTALLED COST of our home energy systems. All WindEnergy7 systems qualify as solar electric, solar water heating, small wind energy, and geothermal heat pump property. This includes all your labor costs of the onsite preparation, assembly, or original installation of the property and for piping or wiring to interconnect such property to the home and its systems. Our Wind/Solar Hybrid Kits are qualified as small wind energy property costs. Qualified small wind energy property costs are costs for property that uses a wind turbine to generate electricity for use in connection with your home located in the United States. The home does not have to be your main home. All WindEnergy7 systems qualify and we show our customers how to get the credits.. no problem. Our Wind/Solar Hybrid Kits are qualified as solar electric property costs. Qualified solar electric property costs are costs for property that uses solar energy to generate electricity for use in your home located in the United States. This includes costs relating to a solar panel or other property installed as a roof or a portion of a roof. The home does not have to be your main home. All WindEnergy7 systems qualify and we show our customers how to get the credits.. no problem. Our Solar Hot Water Kits are qualified as solar water heating property costs. Qualified solar water heating property costs are costs for property to heat water for use in your home located in the United States if at least half of the energy used by the solar water heating property for such purpose is derived from the sun. This includes costs relating to a solar panel or other property installed as a roof or a portion of a roof. To qualify for the credit, the property must be certified for performance by the nonprofit Solar Rating Certification Corporation or a comparable entity endorsed by the government of the state in which the property is installed. The home does not have to be your main home. All WindEnergy7 systems qualify and we show our customers how to get the credits.. no problem. To Buy a Wind Turbine or Become a Wind Turbine Dealer, Please fill out our Contact Form. The system will automatically send you some additional info. We encourage anyone to become involved as a customer, installer, and or dealer of our products. We train and support everyone regardless of your experience level. 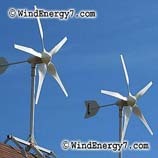 WindEnergy7 is a major nationwide trainer of customers, dealers, and installers of all skill levels. Join Us!